Anyone who has attended an anti-fascist meeting, worth of the name, will have heard the phrase “no platform”. The idea is that fascism is a unique and urgent threat to the left, not just communists or anarchists but even the most moderate forms of social democracy. It threatens to remove the right to vote, the right to organise in workplaces, and the welfare state. To prevent this catastrophe, anti-fascists must deprive the far right of any opportunity to spread its message. For much of the time, the phrase “no platform” is not meant literally: as Evan Smith has shown, the term was coined in 1972, i.e. at about the time that the National Front secured its highest by-election vote (Martin Webster won 16 percent of the vote at West Bromwich in 1973), and when the Front by standing in sufficient number of parliamentary seats was able to put on party political broadcasts, which were watched by hundreds of thousands if not millions of people. No platform was a statement of intent, not a description of the real balance of forces between different groups. That said, there was a time when anti-fascists could use the term accurately: in the immediate aftermath of the second world war. Between about 1946 and 1951, the characteristic form of anti-fascism was the 43 Group, an organisation of militant anti-fascists, dominated by young Jews, very many of whom had recently seen active service. 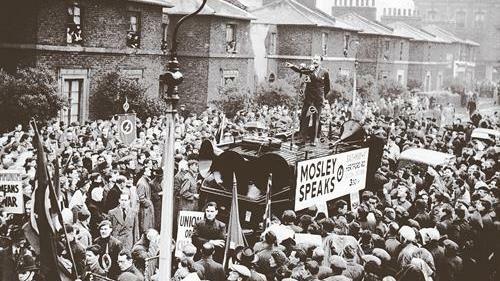 It was never the only form of anti-fascism: the Labour Party and the Communist Party (CP) both supported anti-Mosley campaigns; probably the single most effective group in this period in turning out large numbers of people to oppose the fascists were local trades councils. The 43 Group, moreover, was not a single generation of people with a shared strategy. At one wing, it shaded into Zionism (43 Group literature was effusive about the Irgun). At the other, it overlapped with the CP. Several 43 group members dual carded; including Maurice Essex, Phil Piratin’s election agent, and Len Rolnick, who helped to found the group. A full list would run into the dozens. The 43 Group came as close as any anti-fascists in British history ever had to literally “no platforming” the Union Movement. One of the Group’s distinctive tactics was to group a dozen of its members into an arrow-head shape, then charge into a fascist crowd, with the view of finding the speaker and knocking him down from the platform. In an era before mass ownership of television, almost all public political discussion took place in the open, with speakers standing on boxes or small steps, in one of a large number of local “speakers’ corners”. The Union Movement was sustained by a close-knit generation, at the heart of which were the 750 or so fascists who had been detained in war time. This group went from private to public meetings following instructions from Mosley, reaching a peak of around 20 meetings a week in autumn to winter 1947. With sufficient intelligence, in other words, anti-fascists could establish who would be speaking, at what times, and be pretty confident that they knew every potential fascist “pitch”. Indeed there are reports of 43 Group members travelling by car from place to place, knocking over far-right speakers. A small number of anti-fascists could have a very considerable effect. Moreover, this was immediately after the war, and the majority of onlookers needed no persuading that fascism was a violent and despicable tradition, or that physical resistance to it was a reasonable response. The fascists had relatively few other means of putting their ideas across. They experimented with other approaches – fascist book clubs under neutral-sounding names, entryism in Conservative Parties, employers groups and unions… But they had no real means of going public other than these speaker meetings. By winter 1947-8, the Union Movement had settled on a single tactic to avoid these confrontation, i.e. pulling together all its London meetings into a single venue, and using almost all the group’s active members to protect the stage and prevent its speakers from being knocked over. But this approach could be no long-term answer: by restricting themselves to a single venue (the Ridley Road market in Dalston), their ability to find a new audience was reduced; moreover, the centralisation of British fascists into a single place, made it much easier for local trade unionists, socialists, and communists to organise against them. In March 1951, Mosley announced that he was leaving England for Ireland, complaining, “No man can start a crusade from within a gaol”. He recognised that sustained anti-fascist campaigning had made it almost impossible for his supporters to speak. It is certainly possible to imagine other kinds of anti-fascist victory more relevant to today’s world of decentered communication and social media. Maybe the goal should no longer be the total incarceration, as it were, of fascism but its containment below a level so far below its present level of success that even today’s popularity seems unattainable to its cadres. But when we think of previous cycles of fascist/anti-fascist conflict, we will always look back to the 1940s. This was the lowest point for the British right since the fascist parties were launched a hundred years ago.